If a single lesson emerges from this year’s crop of documentaries at the Toronto International Film Festival, it might be this: Who needs Paris Hilton when you have Agnes Varda? Both the overexposed starlet and the French New Wave legend showed up in Canada this week to watch themselves on the big screen, although at least Varda had the audacity to direct herself. Like most of her famous cinephilic colleagues, the playfully existential octogenarian continually churns out unique, startlingly creative movies. She continues that tradition with her latest autobiographical essay, “Les Plages d’Agnes” (“The Beaches of Agnes), a sweeping visitation to her childhood and early days as a filmmaker. Hilton, meanwhile, showed up with paparazzi in tow for the hotly contested premiere of “Paris, Not France,” first-time director Adria Petty‘s exploration of the hotel heiress’ seedy reputation from the inside out. Although most attendees were less than enthusiastic about the quality of the movie, its presence at Toronto was the cause of ongoing controversy leading up to the premiere, once the festival cancelled all but one screening in the face of threats from Hilton’s camp. If the purpose of Petty’s project was to get behind the crazed Hilton infrastructure, it ended up simply magnifying the problem. Nevertheless, the movie fit neatly into a visible trend of high profile subjects among the documentaries in this year’s program. From Jimmy Page, Jack White and The Edge sending rock fans to cloud nine when the trio showed up for David Guggenheim‘s “It Might Get Loud” to Hilton’s flash-and-click drumbeat, many of the documentary screenings seemed to rival those of the narratives at the festival in terms of sheer star power. Still, the smaller, specialized work of the genre also had a significant presence. “One of the things we’re trying to do is create a balance between those high profile, celebrity-driven works and works that don’t have the same instant recognition, but they’re very complicated, emotional stories that tell us a lot about the world,” said TIFF documentary programmer Thom Powers. Indeed, one of the major themes tackled by several TIFF documentaries, both large and small, involved comparisons of myth and reality. In “Les Plages d’Agnes,” Varda films herself walking backwards on a beach, as if journeying through time and unraveling the crop of stories that have, over years, helped shape her esteemed career. In her characteristically jovial manner, she stages love scenes on the beach to evoke nostalgia for her youth, and even manages to provide a concise history of the French New Wave with help from her colleague, Chris Marker, who hides behind a gigantic cartoon cat. Although frequently humorous, the movie often switches to intimate observations of Varda’s personal woes, such as the scene in which she bemoans the loss of her husband, Jacques Demy. While Varda’s work has specialized appeal, nobody could deny the built-in selling point for the premiere of “It Might Get Loud,” which focuses on a conversation that took place on January 23, 2008 between Page, The Edge and White. The trio discuss their distinctive rock techniques, which vary wildly from White’s down-and-dirty approach to Page’s classically trained riffs. Guggenheim cuts between each artist discussing his background and the details of the conversation, but he refreshingly avoids the cliche of delving into the culture of rock stardom. There’s no doubting that they landed on the right idea. It doesn’t take much of a trained eye to see that these three musicians aptly represent separate generational approaches to rock, which makes the final jam session so interesting. That the collaboration ends up relatively tame is sort of the point. It’s hard to imagine such vastly different aesthetic mentalities finding anything in common beyond the universality of rhythm. Generational continuity also comes into play in “Every Little Step,” a fascinating peek at the auditioning process for the recent Broadway revival of “A Chorus Line,” which recently closed. A kind of “American Idol” for theater geeks, the movie, directed by James D. Stern and Adam Del Deo, seems validated by the resulting production (hardly seen onscreen), which received rave reviews. 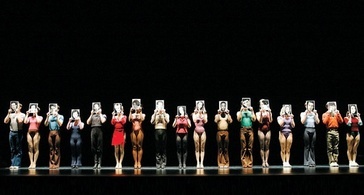 The filmmakers frame the auditions with choreographer Michael Bennett’s original formulation for the show in 1974, when he taped dancers discussing their personal lives. “It’s really about examining a group of people in this society,” the late Bennett says. The documentary does that as well, gliding along the meta wave of a movie about auditioning for a play about auditioning for a play with ease. More conventional documentaries are visible throughout this year’s program. “The Biggest Chinese Restaurant in the World,” from TIFF veteran Weijun Chen (“Please Vote for Me”), doesn’t quite succeed at selling you on the significance of the sprawling West Lake Restaurant in Southern China, which seats five thousands guests at a time, but it still manages to provide a window into distinctive cultural nuances. The founder, Mrs. Qin Linzi, reveals that she has $4 million in assets, and flaunts her prominence in a country that favors male dominance. Ironically, she remains subservient to China’s communist ideals while managing her 1000-person staff. Chen’s verite approach never climaxes with any serious drama, but it retains a mildly interesting anthropological angle. The lower budget documentaries at TIFF also grapple with the myth-versus-reality schema. Although it sounds like a Midnight Madness entry, “Blood Trail” is actually an amusing portrait of war photographer Robert King, whose early days as a wannabe photojournalist in 1993 Bosnia are contrasted with his more accomplished status in the present. Following King through his giddy days on foreign soil, when he can barely muster the courage to run across a bullet-filled battlefield, “Blood Trail” becomes a totally disarming comedy. Later in his career, King remains not completely satisfied with his achievements, raising the question of personal fulfillment that plagues many traveling journalists. “The Examined Life” also deals with issues of self and purpose, but it takes the abstract route. Taking a cue from Plato’s line that “the unexamined life is not worth living,” documentarian Astra Taylor (“Zizek!””) attempts to create a movie exclusively focused on philosophy. Anyone with a tendency to squirm during heavy-handed academic lectures won’t find much respite here, but patient types are bound to discover a series of entertaining personalities not unlike those on display in Richard Linklater‘s “Waking Life.” Taylor gives a variety of excitable philosophers, including Cornell West and Avital Ronell, ten minutes to discuss the practice of philosophical discourse. Although it generates a constant sense of contemplation, the arbitrary narrative does start to wear after the first few encounters. Comical documentaries present a certain challenge; documentaries that cause authentic emotional discomfort face an entirely separate one. “The Heart of Jenin,” a moving portrait of Middle Eastern turmoil seen from the specific angle of a Palestinian father, uncovers familial discomfort that few screenwriters could possibly portray. In 2005, twelve-year-old Ahmed Khatib was accidentally shot by Israeli soldiers who thought his toy gun was real. After his death, the boy’s father, Ismael, agrees to donate his son’s organs. Among the many recipients is an Orthodox Jewish family, whose beliefs don’t exactly correlate with those of the Khatibs. The tension between the two backgrounds, as Ismael attempts to maintain contact with the Israeli family and continually fails, culminates in a remarkable confrontation. As far as confrontations go, however, nothing gets more awkward than the ones making up the bulk of “Religulous,” where filmmaker Larry Charles (“Borat”) follows Bill Maher around as the comedian confronts a variety of religious extremists and mocks their perspectives. Maher’s circus routine is easy to enjoy, particularly since it appears driven by his assertion that religion has become “detrimental to the progress of humanity.” That conclusion holds steady, but the movie suffers from serious structural problems.